Rugby union, commonly known as just rugby, is a popular sport played around the world. Renowned for strength, speed and cunning. It is a full-contact sport played without protective gear. Players attempt to move the ball to one end of the rectagular field via carrying, kicking and throwing the ball. Rugby union is played by two opposing teams of 15 players on a field with two H-shaped goalposts at opposite sides. An oval-shaped ball is used and teams are awarded points for scoring tries (touching the ball on the ground) at the opponents end of the field and can then do a conversion (kick the ball over the post) for more points. Rugby is a game that has been known for its brutality. Rugby is also known as the game that is played in heaven. Rugby 7s — like Rugby Union except with fewer players and over shorter time period. 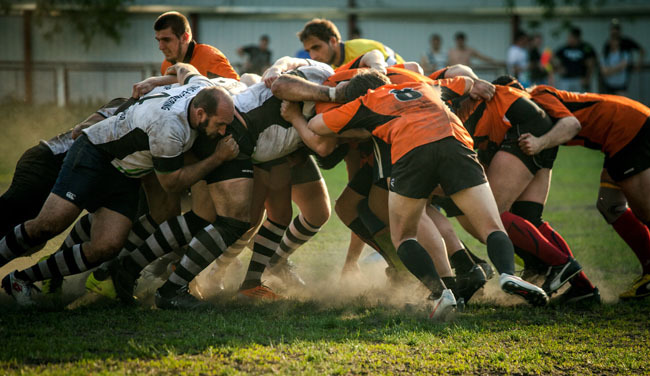 Arena Rugby — a variation of Rugby Union, played indoors on a smaller field resulting in a faster and higher-scoring game. Touch Rugby — a team sport derived from Rugby Football, in which the tackling is replaced with just a touch. Snow Rugby — rugby union matches played on fields covered with snow. Rugby Tens — also known as ten-a-side and Xs, is a variant of rugby union that originated in Malaysia, and is popular in many Asian countries. Mini Rugby — a modified version for Rugby Union, to make the sport suitable to be introduced to children. Wheelchiar Rugby — a full contact indoor team sport conducted for players with disabilities. Rugby League — a rough game involving tackling the players in a bid to get the ball, with each team attempting to carry it over the end line. Lelo Burti — a Georgian folk sport, a full contact ball game very similar to rugby. Yubi Lakpi — a seven-a-side traditional football game with similarities to rugby played in Manipur, India, using a coconut. Eton Wall Game — a bit like rugby union, the objective of the sport is to move the ball along a curved brick wall towards the opposing team's goal. Played only at Eton. (from Unusual Sports).